I am baking cakes, making a huge trifle and an even bigger pavlova. I'm sure you are all doing something similar. This is a short post to wish you all a very Happy, Restful and Enjoyable Christmas - I hope Santa brings you everything you wished for. For most of us I think it will be the rest that we look forward to - and the odd glass of wine and mince pie!!!! 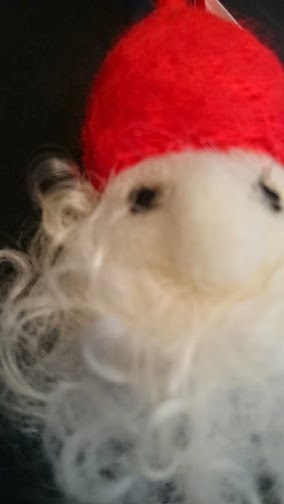 nid-noi.com is closed for the holidays now until January 1st. There will be a short window in which I can get orders out as I will be flying to New Zealand for three weeks - to teach - on January 7th. Sooooo - orders received between now and January 5th will be posted on January 6th at the latest. After that - no orders will be posted until February 2nd. You are most welcome to order products while I am away, but they wont be posted until February 2nd. I hope this doesn't inconvenience too many of you. My love to all of you - you know who you are!!!! My lounge, full of Lindsey Gibson's beautiful felt wall pieces. It's that time of year - we are all belting around - getting ready for Christmas. 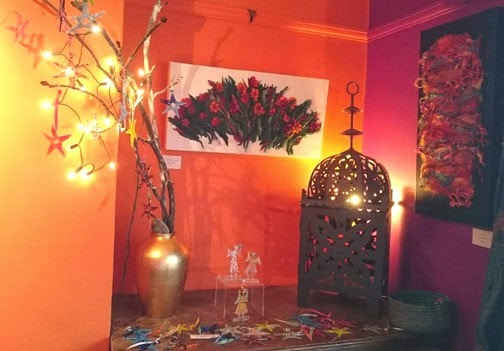 Here in Brighton we have the Christmas Open Houses, we are about to have our second weekend. This will be my last Open House in Brighton as I will be moving to Redditch in the Spring. 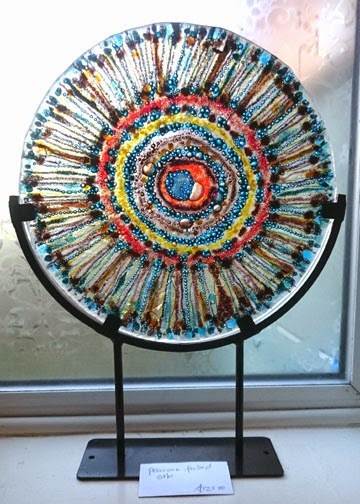 The house is full of stunning work, It is worth all the clearing out to show off all this beauty. The website is - www.one2six.me.uk, how to find us is on there too. More of Lindsey's work . . . and some of Annie's stars and angels . . .
We have quite a variety of work . 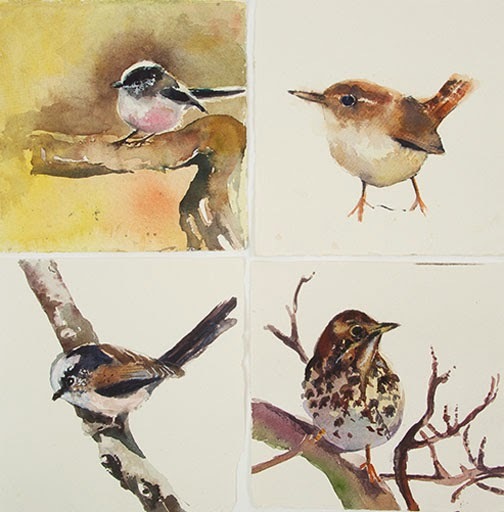 . .
Watercolours by Emily Jolley . . .
Jewellery by Fenn and Co. . . . 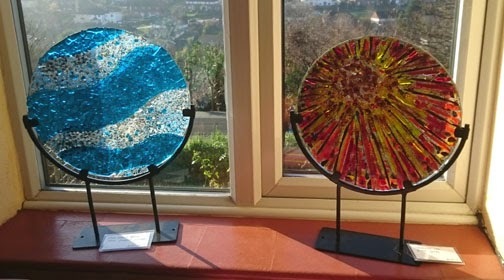 Stunning glass by Annie McMullan . . . . Textiles for the wall by Sylvia Lynton . . . .
My friend John Culligan from France has sent over some gorgeous turned wood bowls . . . . 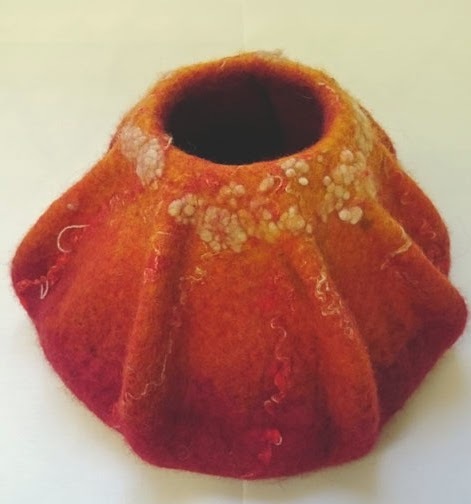 This is one of John's yarn bowls - you put your ball of wool in the bowl and thread the yarn through the hole - your ball of wool stays in one place, and away from your pets. They are a very popular purchase. 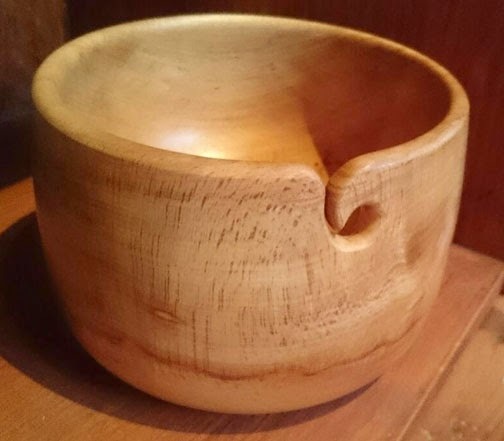 This one is in spalted Beech. 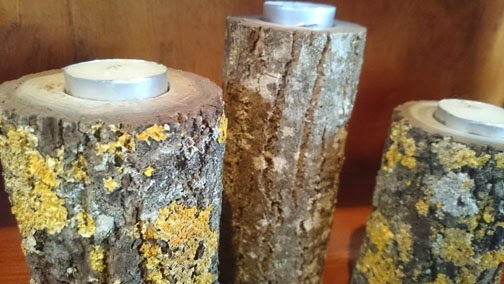 A few of John's candle sticks . . . .
Downstairs in the bathroom we have a rather aquatic theme . . . . 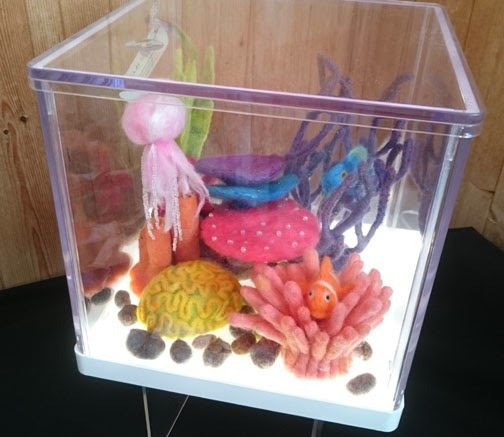 Felt seahorses and fish peeking out from anemones. 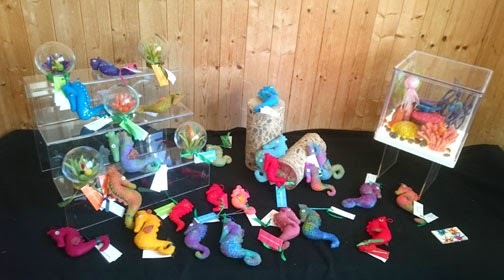 These are all made by Jayne Routley of Lady Lazarus. This installation lights up!!! 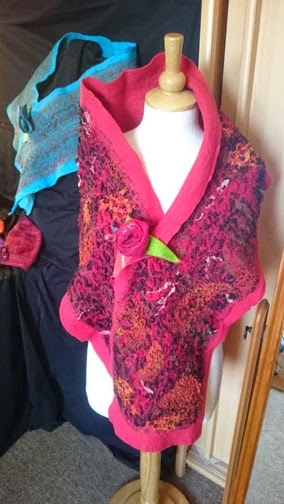 In the 'dressing up' room downstairs we have a selection of Janyes scarves and shawls . . . Her monkeys . . .
. . and her fish . . .
And not forgetting . . . . . .
Lots of this little chap to hang on the tree. 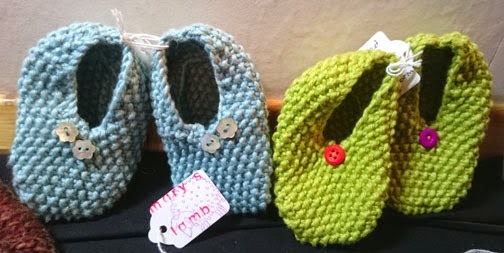 Alison of Marys Lamb makes gorgeous knitted accessories. Babies booties . . . 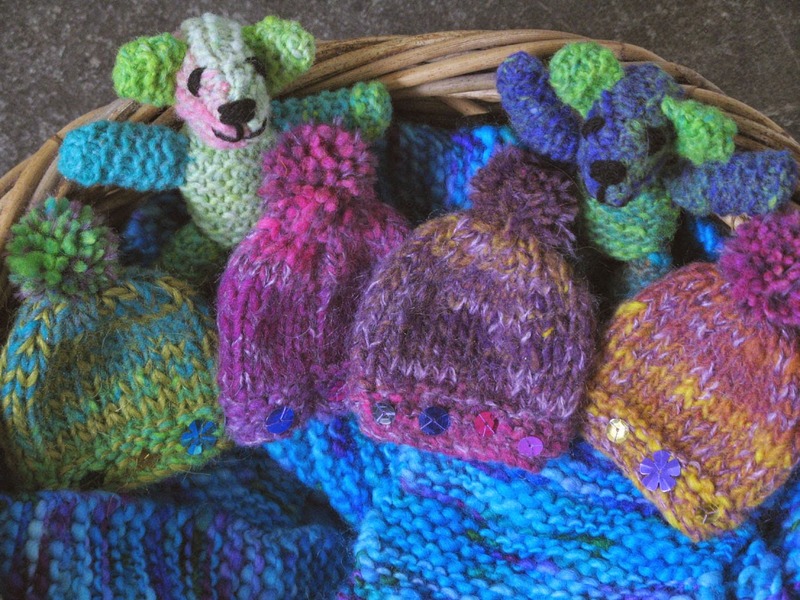 Egg cosies, scarves, tiny bears - all manner of lovely things to keep you warm. And then of course there is my range of earrings and brooches . 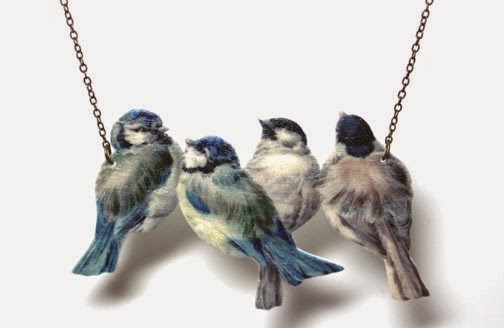 . .
my new blue bird earrings and brooches . 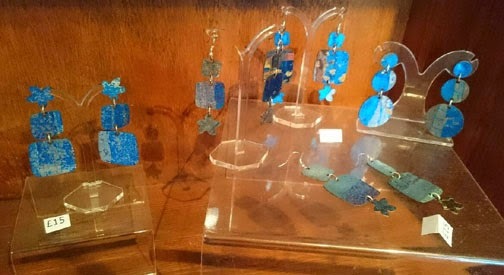 . . .
. . . and a few of my new earring designs . . . So - we have lot's for people to see, artists to talk to . . . and of course cake to eat. Do come along to see what we are up to if you are anywhere near Brighton for the next two weekends. 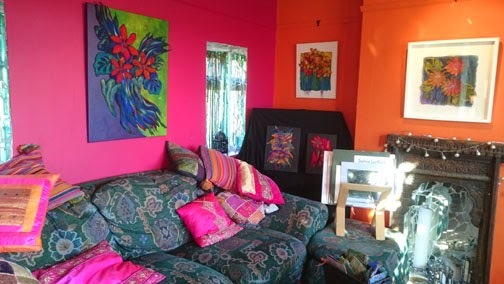 You can be assured of a very warm welcome to our colourful and unusual house. 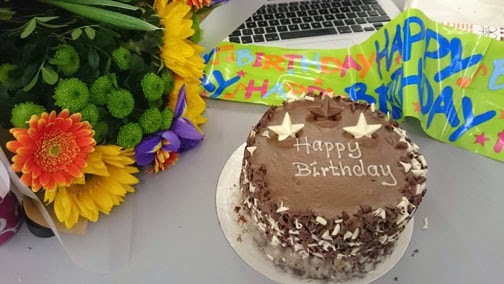 A cake and flowers for my birthday.
. . . and then another cake . . . !!! 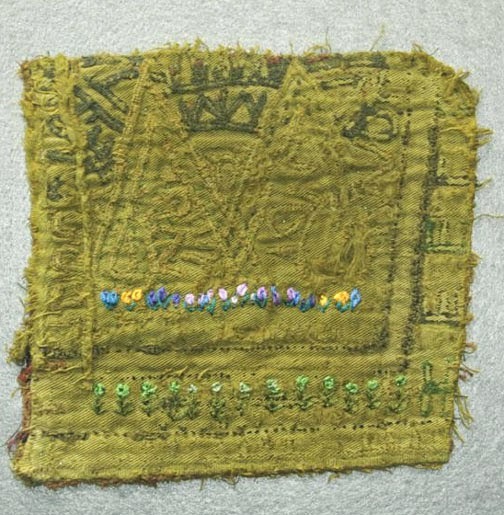 We are now over halfway through Experimental Textiles, this session was the sixth of nine. I have only ever taught one group at a time before, this year we are running two groups - a Thursday/Friday and a Saturday/Sunday. We will be doing the same next year. It is very interesting teaching the two groups side by side - they are both strong and are producing some excellent work. One thing that I hadn't considered was the air of competition creeping in between the groups. It is light hearted - but very definitely there!!! 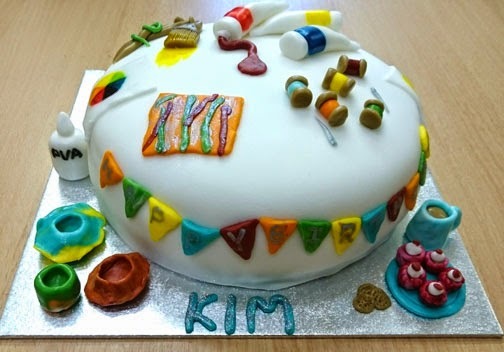 One of the benefits of having two groups - when the tutor has a birthday - you get two cakes!!! When we are all settled with coffee (and cake) first thing on day one of the session - we look at what has been done for home work produced to reinforce what did on the session before. 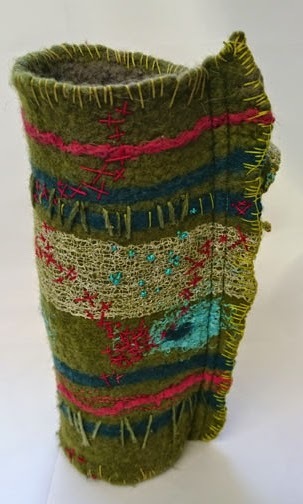 On the previous session we had looked at constructed textiles - felt, knit and weave, and how you can make your work 3D. 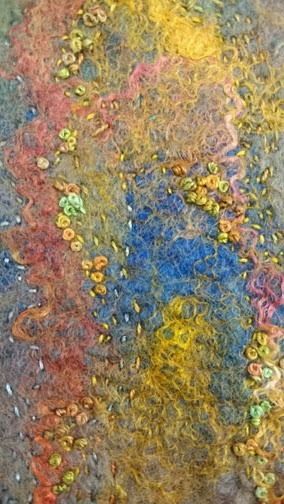 This is a just a small selection of what the groups brought in . . . .
Rachael experimented further with felt . 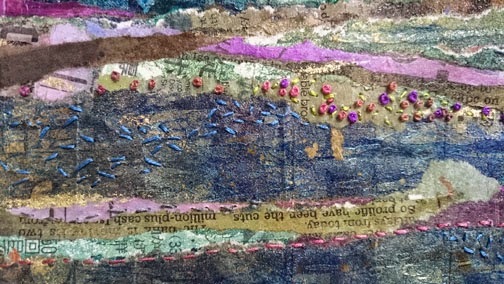 . .
and then stitched into it. Beautiful. 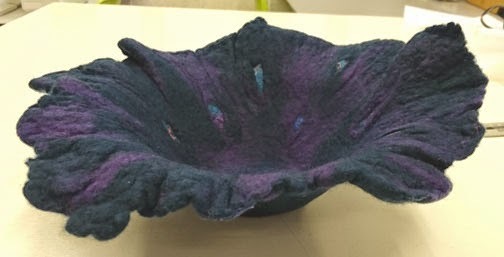 Mary felted this lovely bowl . . . .
and played around with combining stitched paper with felt. 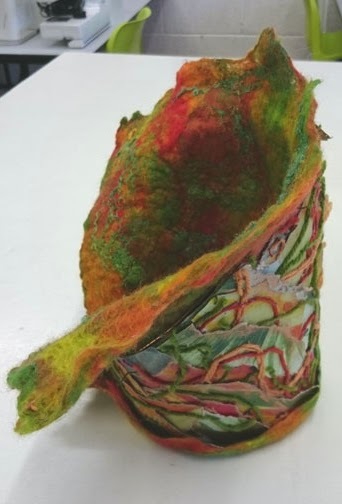 Jane created this fabulous little vessel . . .
and this one. 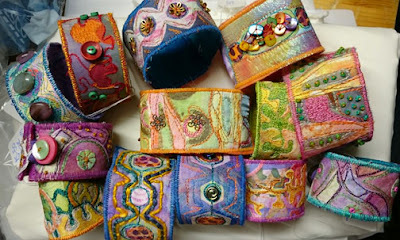 Lots of fabulous hand stitch. 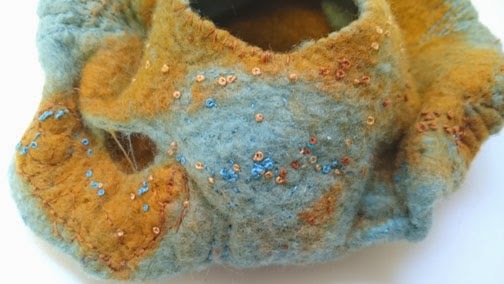 Kate stitched into one of the bowls she made on session five. Very delicate. Once we have looked at and discussed all the homework, we have more tea and coffee and then set up for the task of the day - which was dyeing natural fabrics with procion dye. I use the the dyeing in a plastic bag technique. It is a great way to see how several different types, weights and weaves of fabric absorb dye. 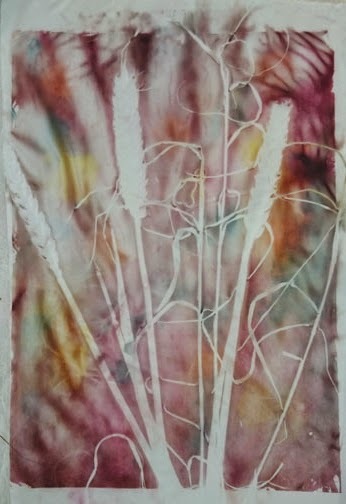 We dyed cotton, silk and viscose. The fabrics were cut up up and placed in the plastic bags and wet the fabric, giving it a good squidge about to make sure the fabrics are thoroughly soaked. The dyes . . . 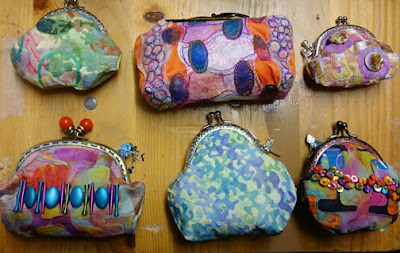 The students then play with colour, using pipettes to add dye to the bags of fabric. 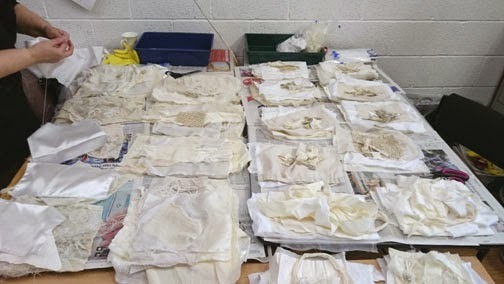 The bags of dyed fabric are then put into plastic trays and left over night and washed out the next day. This process only take up the morning so we had the afternoon to prepare the papers for transfer printing on the second day of the session. The girls painting disperse dye onto copy paper. I think it is very important for students to be able to colour and print their own fabrics, it helps make their work distinctive, more original. This is why we spend a whole session on colouring fabrics. Synthetic fabrics are coloured with different dyes to natural fabrics. Synthetic fabrics are coloured with disperse dyes. These dyes usually come on powder form and you mix them with water - it's as simple as that. The dyes are then painted onto a non absorbent paper and left to dry. 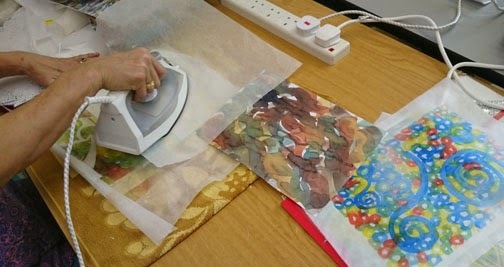 Ironing the papers onto fabric between baking parchment. 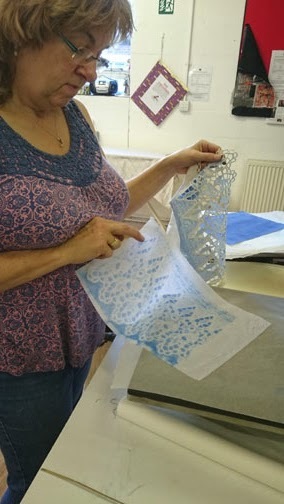 Once dry, the papers are laid, paint side down, onto your synthetic fabric - placed between baking parchment, and then ironed, slowly, for a couple of minutes to transfer the dye from the paper onto the fabric. 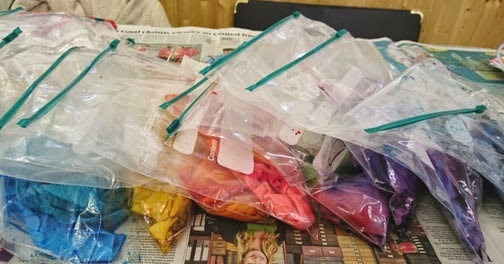 This is how the dyes have become known as 'transfer paints'. The iron needs to be as hot as your fabric can stand and off steam. The dyes look very dull until you iron them off . . .
Kate using the heat press. If you have access to a heat press - this can really speed up the process. We have one in the IDC studio at The Old Needle Works. 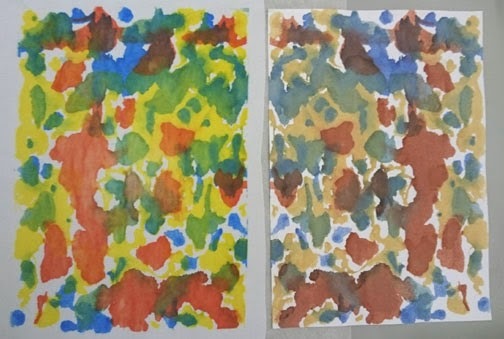 The painted paper is on the right - the print is on the left. You can see how much brighter the colours are when applied with heat. Again, the painted paper is on the right and the printed fabric is on the left. 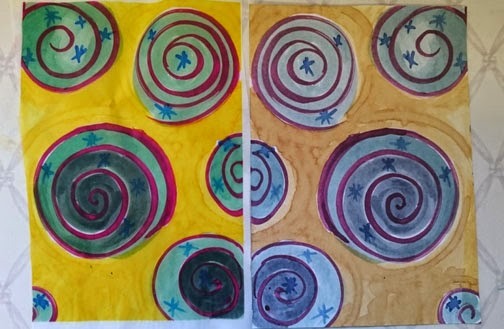 The painted paper is on the left - this was then ironed onto a satin and a fine crepe. 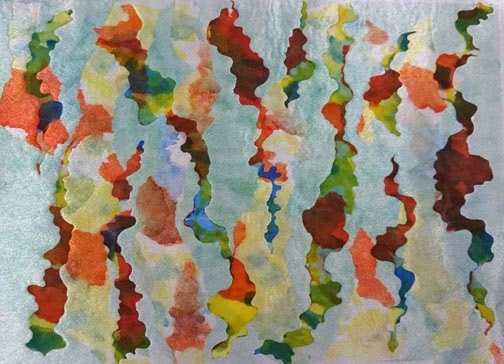 You can usually get at least three prints from one painted paper. Disperse dye is translucent, layering the prints will create beautiful shadowy effects. 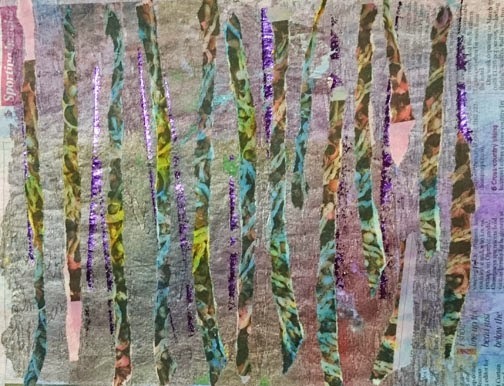 Using resists is great fun when you transfer print - you simply lay your resist between the fabric and the painted paper and then iron or heat press to transfer the colour. Stalks of wheat used as a resist. 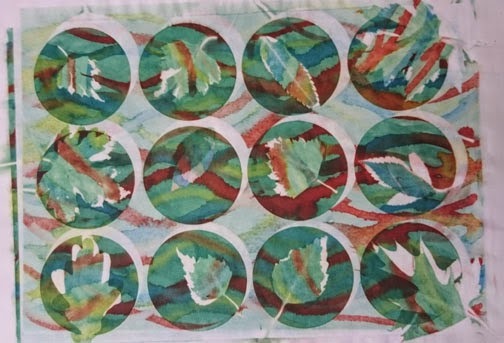 Using stencils and leaves as resists then turning the leaves over and printing off the dye they have collected. 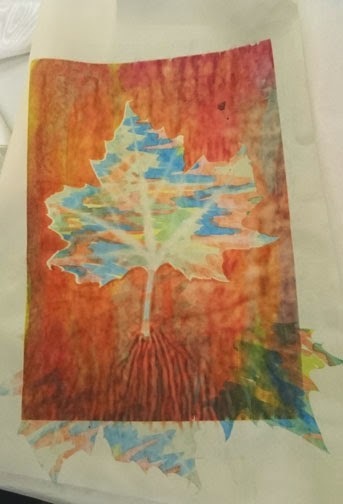 Another resist print with a leaf - which was then turn over and printed. 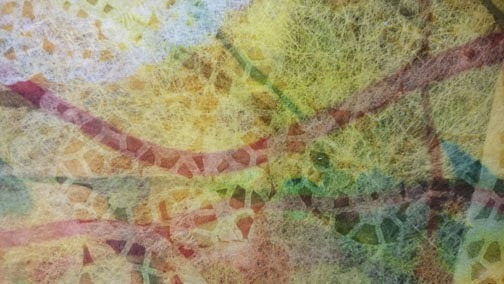 A detail of a print using a doily as a resist. The groups have printed a large amount of fabric - I am excited to see what hey will be doing with them. Because we were working with synthetic fabrics - it meant we could cut them with a soldering iron and zap them with a heat gun. 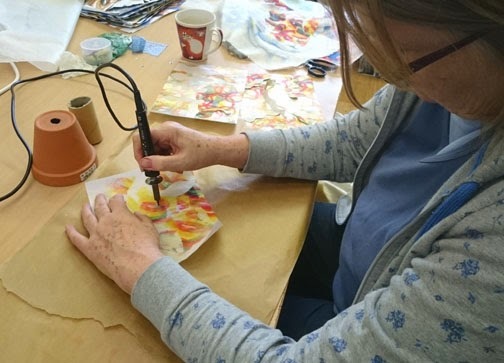 Marilyn cutting her applique shapes with a soldering iron. A print is ironed onto Bondaweb, the backing paper is left on. Shapes are cut and lifted off the backing paper and ironed onto another printed background. This is basically applique, just cut with a soldering iron as opposed to scissors. 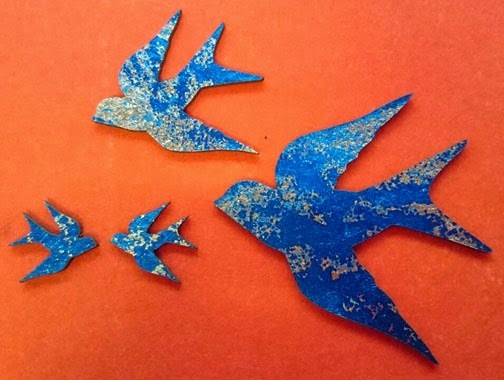 You can achieve more intricate shapes with a soldering iron. 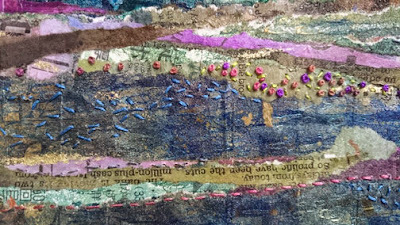 Because the layers of applique are all printed, the applied shapes merge in and out creating an interesting surface on which to stitch. A more contrasting sample of the applied layers. 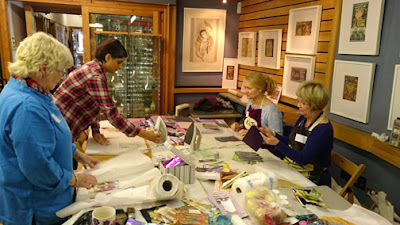 We had a great two sessions, I am just about getting used to teaching the same session to two groups. It's a bit like groundhog day!!! I can't wait to see what they all get up to for home work. Rachael, who is on the weekend course, writes a blog about the trials and tribulations of being an 'ExTex' student. 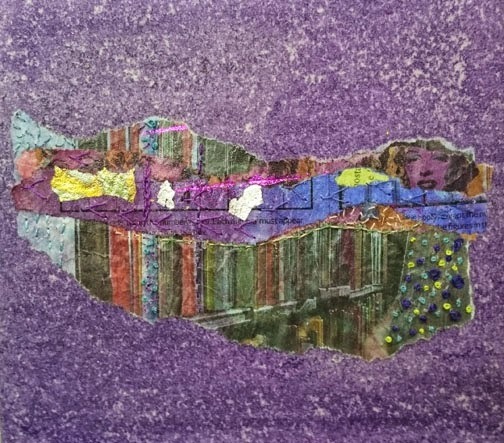 You might like to have a look at it - do look at the previous posts, particularly the one on collage. I am continually and happily surprised at the effect the course has on students and how dedicated they become. Two of last years students are re-doing the course this year. When this was first suggested to me my first response was -"ooh!!! Didn't I teach the course right the first time?". But what has happened is that students want to continue with their studies, they realise that if they are on a course, there is more likelihood they will get some work done. I didn't have the time free with my other teaching to offer a continuation course. Until now! We already have five students enrolled for Experimental Textiles 4 which starts next June. 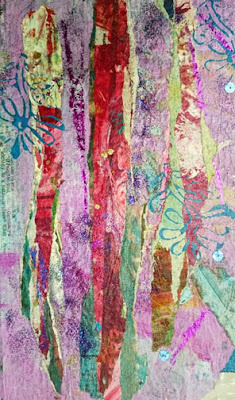 Layers of applique cut from transfer prints. 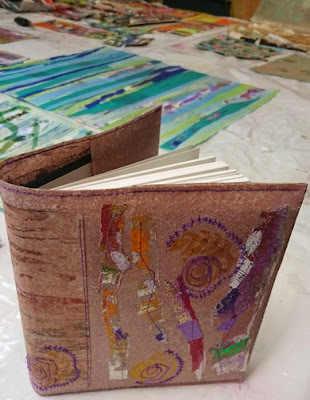 I have cleared five weekends for a continuation course only for the past students of my Experimental Textiles course at The Old Needle Works. It will run from July 2015 - February 2016 and I expect it to roll on from there. As I will be living in Redditch by then it will make it easier. The course will be more concept based with me taking more of a mentoring role. The group will be supported through their further development and it is my hope they will be an exhibiting group. The name of the group will be ExTeXtra!!! I am writing this in the room of my hotel. 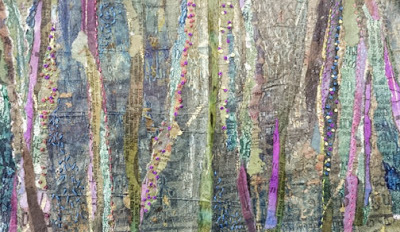 I am in Harrogate ready to set up the Vilene stand at The Knitting and Stitching Show at the Harrogate International Centre. We are on stand number TG540. Laura arrived by train last night and I drove up from Brighton. The show opens tomorrow - it will be great to see all our friends again, particularly Viv and Kevin from Art Van Go www.artvango.co.uk who Laura and I shared a house with in Dublin when we did the show there and then I taught at Art Van Go last week. So - watch this space. . . . I will post about the show . . . later!!! I'm looking forward to seeing many of you at the show. 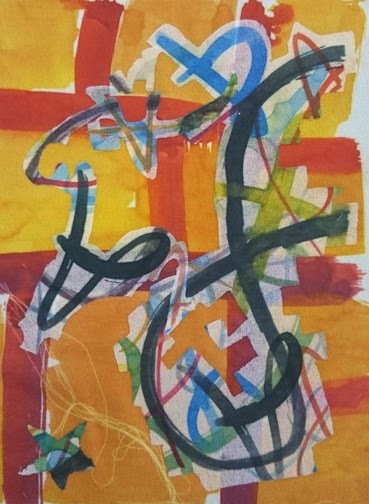 A very sensitive and subtle piece. This would make a beautiful cover for a tall night light/candle holder. You would just need to stitch a back seam to create a tube. 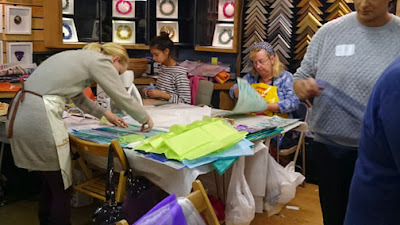 So, a busy week this week . . . .
Tuesday and Wednesday I was teaching a 2 day workshop at Art Van Go - Reclaimed Papers. 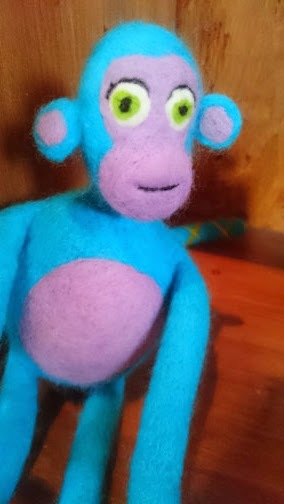 It is great fun - you don't have to make anything that looks like anything - it is a great process. Just tearing and layering. The group all cracking on. 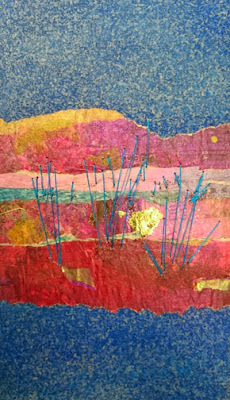 I love teaching at Art Van Go www.artvango.co.uk. It's a great space to teach in, plus I get to see Viv, Kevin and the team. 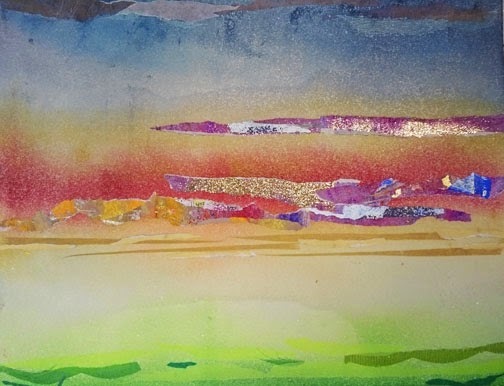 This was my last workshop this year - and is was fabulous. The group worked really hard, and Viv and Kevin were on great form. Torn, painted newspapers torn and layered up with painted Bondaweb. 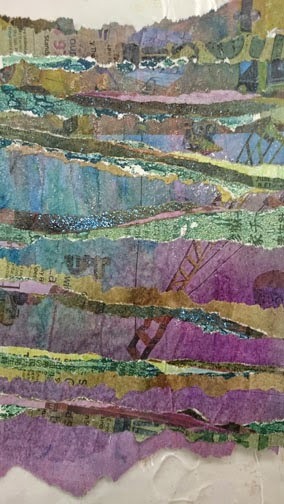 This process is featured in my book Reclaimed Textiles - it's called 'Pretties and Background'. More papers ironed onto Decovil 1. 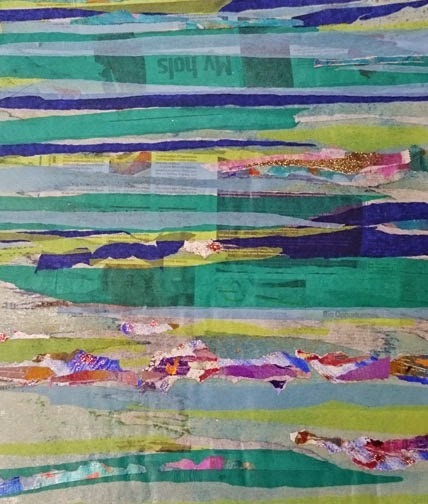 Torn layered newspaper - just beautiful - who'd have thought newspaper could look sooooo good. This book cover was acrylic waxed then stitched into - beautifully. 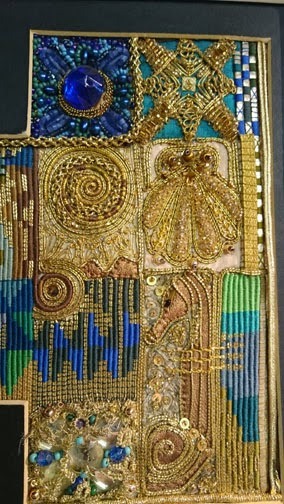 A detail of the book cover. 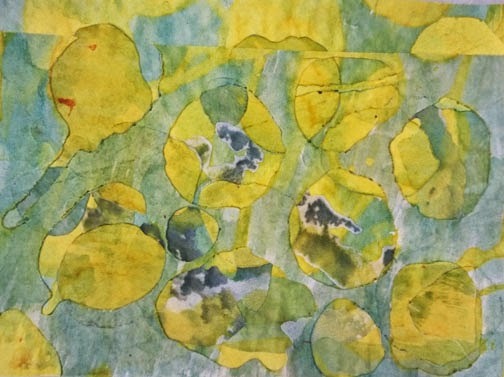 One of the students has an art based background and produced some very interesting work . . . .
More considered play . 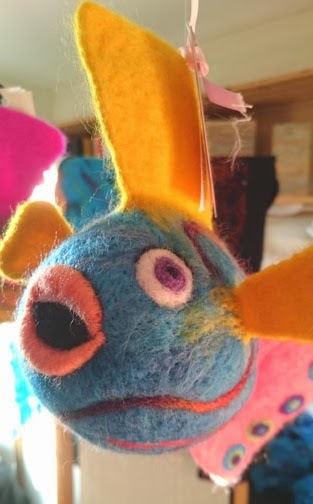 . .
All with some very splendid stitch. 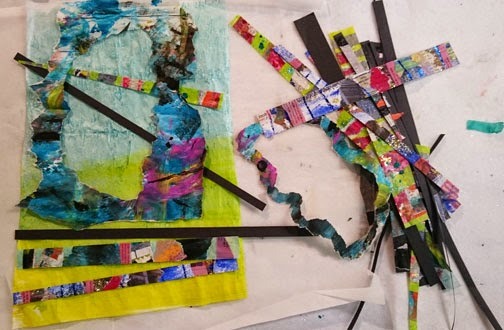 I will be teaching three workshops at Art Van Go next year - starting with my annual design workshop in June. 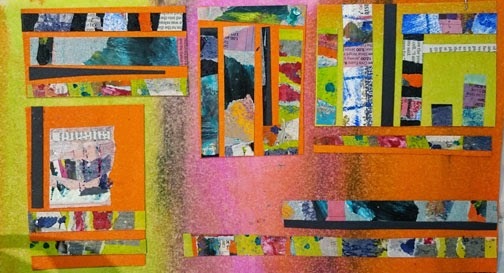 The current exhibition at Art Van Go is a collection of work by Margaret Nicholson. 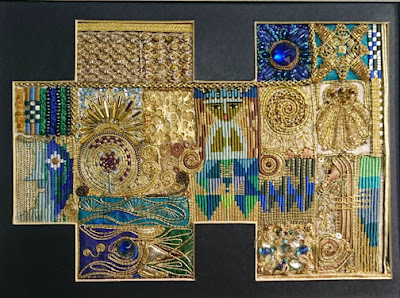 Her work consists of Or Nue, beading and metal threadwork. The exhibition is on until November 23rd. If you haven't seen this collection yet, I highly recommend it. All the work was done AFTER Margaret was 65!!!! Once this exhibition comes down, 'Made at Art Van Go' will be going up. As it's name suggests, the work show will have been made on one of the many workshops that Art Van Go run through out the year. 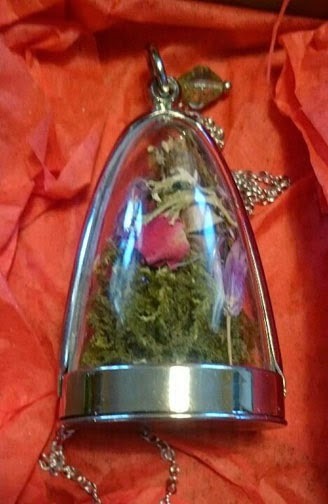 it is a great idea and the work will be wonderful. 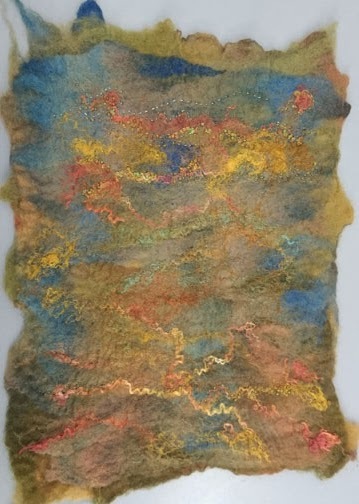 While I was there this week, Janis showed the work that one of the students on my Transforming Transfer course had created. It is always good to see what students have done with work created on your course. These divine purses have been made by Sharon Davis - aren't they delicious?
. . . and these cuffs . . . . If you get a chance to see either or both of these exhibitions - you will not have had a wasted journey. I am now up in Redditch teaching my two ExTex 3 groups, I will post about what we are up to after the weekend. I was told today that we already have 4 students enrolled on our next courses that start next June. 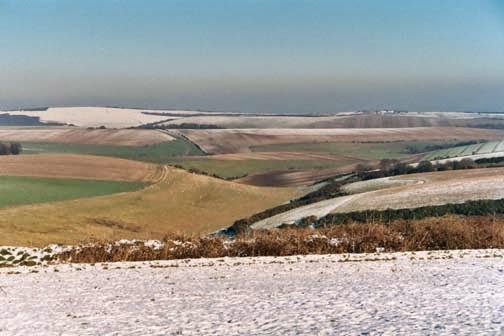 I have decided to move up here - I need to be able to offer more support to my current and ex students up here. I will be starting a new continuation course for past Experimental Textiles students next year - as well as timetabled courses. I will be putting my house on the market when I come back from New Zealand in January . . . new beginnings . . . .